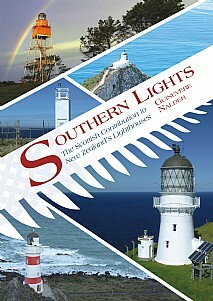 Southern Lights recounts the story of how New Zealand's lighthouses were established through the transfer of technology from Scotland to New Zealand over a period of almost 90 years. This resulted in most of New Zealand's lighthouses being fully or partially built using Scottish materials and expertise. The major Scottish contribution was the professional services provided by the firm founded by Robert Stevenson although by the time the first lighthouses were built in New Zealand, Robert had died and his eldest son Alan had retired. The firm of David and Thomas Stevenson thus took on the first commissions and its successor companies over a period of 80 years were Consulting Lighthouse Engineers to the New Zealand Government. They arranged tenders, advised on technology, supervised manufacture and despatch of lighthouse components and stores, and much more, proving invaluable to the New Zealand Agent-General in London. It was on this basis that in the period 1859 to 1941 38 major lighthouses were built; 30 of which were constructed between 1865 and 1897. Despite New Zealand's limited industrial base, this arrangement ensured they had access to Scottish lighthouse technology and expertise. Thirty-three were built using Scottish designed and built lanterns and apparatus and Scottish-designed lenses, although these were of French or English manufacture. Of the other five, two were eventually replaced by Scottish lighthouses, two were upgraded with Scottish technology, and the fifth remains the sole example of English lighthouse design, although in its time was supplied with Scottish equipment. Scotland also supplied trained professionals who manned the lights, designed and administered them. This well-researched history of the Scottish contribution to New Zealand's lighthouses will be of immense appeal to all lighthouse enthusiasts, anyone with an interest in maritime history and especially those living in New Zealand and Australia. ‘...highly recommended to anyone with an interest in lighthouses, whether in New Zealand or Scotland, or more widely... ...a book which is going to have enduring value as a work of reference long into the future. ... The depth of research that underpins it is reflected in the long lists of references that conclude each chapter. Despite this the book remains approachable and readable, and fascinating. ...superbly illustrated... ...the best book anyone is ever going to be able to write about its subject and is a real pleasure to read’. Undiscovered Scotland Read the full review here.